* Keep your passwords private – never share a password with anyone else. * Do not write down your passwords. 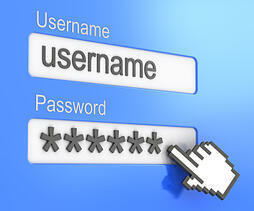 * Use passwords of at least eight (8) characters or more (longer is better). * Use a combination of upper case letters, lower case letters, numbers, and special characters (for example: !, @, &, %, +) in all passwords. * Avoid using people’s or pet’s names, or words found in the dictionary; it’s also best to avoid using key dates (birthdays, anniversaries, etc.). * Substituting look-alike characters for letters or numbers is no longer sufficient (for example, “Password” and “P@ssw0rd”). * A strong password should look like a series of random characters. * On the web, if you think your password may have been compromised, change it at once and then check your other website accounts for misuse. At work, change your password at once, and then call your company’s IT Security help desk. 1) Think of a phrase or sentence with at least eight words. It should be something easy for you to remember but hard for someone who knows you to guess. It could be a line from a favorite poem, story, movie, song lyric, or quotation you like. Example: "I Want To Put A Dent In The Universe"
5) Finally, use special characters ( $, &, +, !, @) to replace a letter or two -- preferably a letter that is repeated in the phrase. You can also add an extra character to the mix. (Here, we’ve replaced the “t” with “+”, and added an exclamation point at the end.) : iW+pAD1tU! There are good password manager software products on the market today. Some are free; none are very expensive. Using one of these products, you can create truly random, very long, and unique passwords for each site, and because the software will remember them for you, you never have to worry about what your password is. Your password manager will store and encrypt the passwords for you, and log you in automatically. You will have vastly improved security, with only one master password to remember. Use the above 5 steps to create a very strong master password! This is a small section of KnowBe4's Kevin Mitnick Security Awareness Training. Our integrated training and phishing platform allows you to send fully simulated phishing emails so you can see which users answer the emails and/or click on links in them or open infected attachments.